The Music Zoo, NYC currently lists this vintage '68 - 3 tone burst Strat, fat head and all. "...This guitar is incredibly clean for its age, with typical natural relic’ing that can occur over 45 years. The F plate has serial number 242218 which confirms its production date, along with the neck stamp which dates September, 1968, and the pickups are also dated from ‘68. The pots are apparently from the 24th week of 1966, which is common because Fender bought pots in bulk around this time. 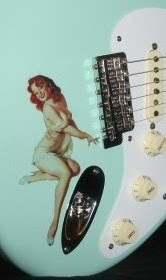 This guitar comes with the very rare and desirable “Green Chicklet” capacitors, which were only produced in 1968 and made famous by Hendrix. All the parts appear to be original and period-correct. It’s going to be hard to find another ’68 Strat that is in this kind of condition, since this was a low production year for Stratocasters, and nothing sounds quite like the real thing! The guitar weighs 7 lbs 14 oz and includes a vintage hardshell case, tremolo arm, and ashtray bridge cover."